I’m very fussy when it comes to steak, I can’t stand fatty cuts yet begrudge anywhere I have to pay through the nose for a good steak. Because of my standards I’m pretty sure I didn’t eat steak out for a good 5 or so years. Then I found Flat Iron. Steak has never been such an obvious choice…Saying that…it’s the only choice! 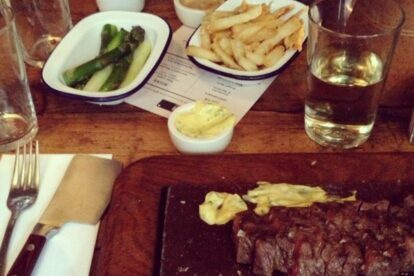 The menu consists purely of one cut of steak for a very reasonable £ 10 and a few simple yet well executed sides. The steak is served with a mini cleaver, which is every alpha male’s dream, but you barely have to use it as the steak is perfect and just falls apart on its own. The only downside I’d say is that they don’t take bookings but this only gives you an opportunity to have a drink in their basement bar beforehand before being seated. The slightly rustic décor adds to the simple rawness of the place and lovely details such as the tin cup of salted popcorn you’re given as an appetizer really make for a pleasant evening.